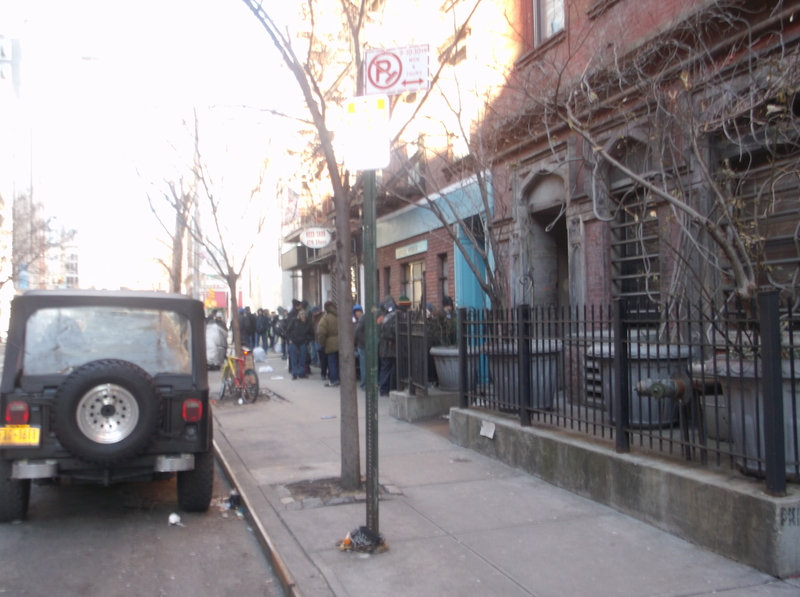 9:35 Christmas morning: Men awaiting breakfast at the Catholic Worker where, in the spirit of Christ and Dorothy Day, it is served for the hungry all year round. 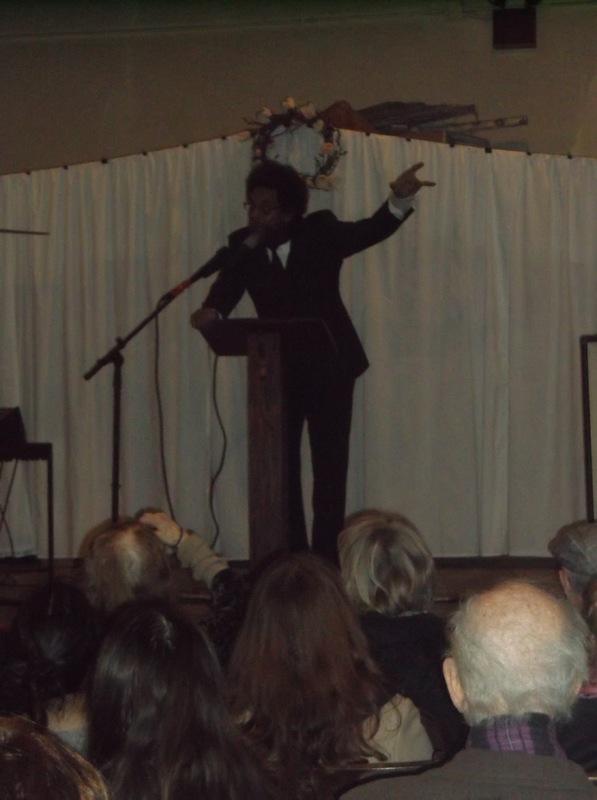 In an extemporaneous address that could only be called symphonic in its structure and effect, Dr. Cornel West spoke to an overflow audience at the Friday Night Lecture Series of the Catholic Worker on the occasion of founder Dorothy Days’ birthday. West, a self described “free spirited Baptist” revealed a profound knowledge and insight into the corpus of Day’s words and spirituality, finding connections from everyone from Socrates to Dostoevsky to John Coltrane in Day’s simple if enormous dictum that “Life is about love overflowing. ” West drew inevitable connections from everything to the indignity of Stop and Frisk to the murder by drone foreign policy of the Obama administration in the absence of such spiritual awareness and maturity. West was as sublime as the subject of which he spoke. It was a most joyful and bracing occasion. 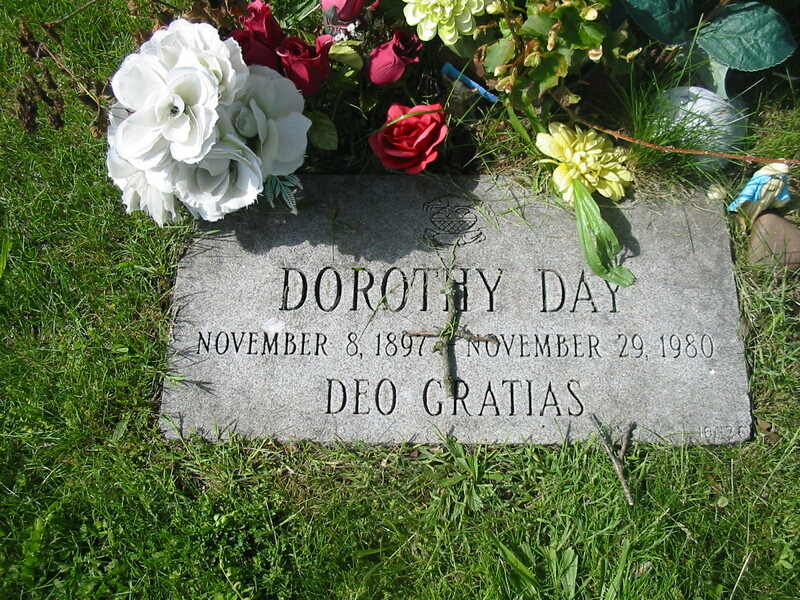 And so on Memorial Day Weekend I went to visit my Ma and together with my wife and child went to visit the grave of Dorothy Day, the astoundingly bold and beautiful co-founder of the Catholic Worker movement. My mother, a devout Catholic who raised and fed eleven children largely on her own after my father’s untimely death at age 52, has a soft spot for Day as well as a similar sensibility. Dorothy Day raised one child but fed untold thousands of men and women whom she perceived as nothing less than children of God, but not before she spent years as a hard drinking journalist of a decidedly anarchistic bent. Day was the acting editor of The Masses when it was shut down by the U. S. government and she was arrested for picketing Woodrow Wilson’s White House for women’s suffrage. Day was also known for hanging out with the likes of Eugene O’ Neill and Kenneth Burke, both of whom it is said, she could drink under the table. Quite a feat, given the thirsts of such crazed Irishmen. But that was nothing to what she would do in years to come. While she was still young, Dorothy underwent a crisis of meaning, brought forth, in part, by her experience of having an abortion. This crisis resulted in her conversion to the Catholic Church, hands down the most historically repressive of all Christian denominations and at the same time the church with the richest intellectual and cultural legacy. In short, a complicated institution to say the least. Some of Dorothy’s friends were lopsided with shock at her conversion, some considering her mad. Mad she was and mad she remains in the context of the culture of what William Blake called “Selfhood” in which she was raised and which rages on in ever greater ferocity and diabolical intensity in our own time, when in 1932 she met the enigmatic Peter Maurin. Together they embarked on a project based on the Sermon on the Mount which was both very simple and very radical: to build a “ society in which it will be easier to be good.” Five months later, at a May Day rally in Union Square, the first Catholic Worker newspaper was sold. The price of the paper in May of 1932 was one penny. Catholic Workers were selling copies of the paper this May Day in Union Square. The price of the paper in May of 2013 remains one penny. Around the same time Dorothy opened the first Catholic Worker hospitality house in which anyone who showed up was fed, no questions asked. There are now over one hundred spread out in cites all over America. God only knows how many thousands and thousands of despised and desperate souls were fed by Dorothy and those who came after her. Moreover, there is but one rule: To proselytize was and remains forbidden. This work of the Catholic Workers is strangely taxing. The people who come to eat are sometimes crazed and often filthy. They are the Unwanted. The Weak. The Failed. They embody the most damning of all American insults: they are the Losers. Their mere presence calls all kinds of metaphysical and theological questions into mind. One must have iron faith. One must have limitless compassion. One must make your breathing and believing one or you may well run out the door in horror. I was shocked and asked him what on earth he meant by that. Jim went on to say that when you are in love with someone, you see only the good in that person, only the potential in that person. That, said Jim Douglass, was how Dorothy Day saw the world. I think of those words from time to time or rather they swim into my consciousness to haunt or invite or inspire depending on my mood and my strength at the time of their always unexpected arrival. They bespeak of a spiritual state I can only call sublime. They describe a spiritual power of which I am in awe. 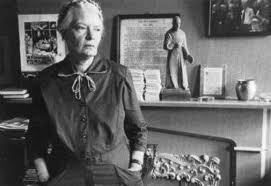 Dorothy Day was a Catholic anarchist. Such a thing is an absurdity, something that should not logically exist. But then so is the sun. And so is the soil. And so a song. And so a frog. And so you. And so I. And so all. 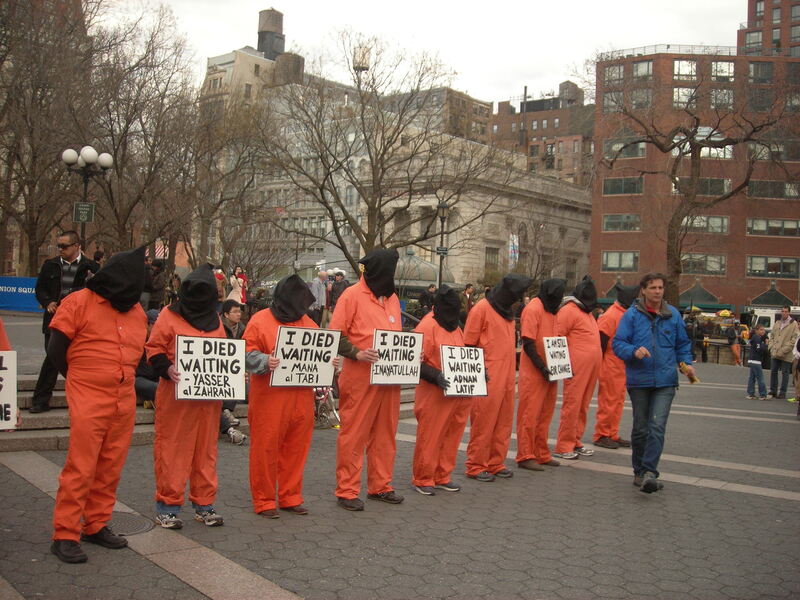 Members of the Catholic Worker and Witness For Torture gathered together at Union Square on this, the most solemn day of the Christian calendar to remind all who passed of the appalling reality of the conditions at Guantanamo Bay, Cuba which remains open fours years after President Barack Obama promised to close the prison within a year of his first inauguration. 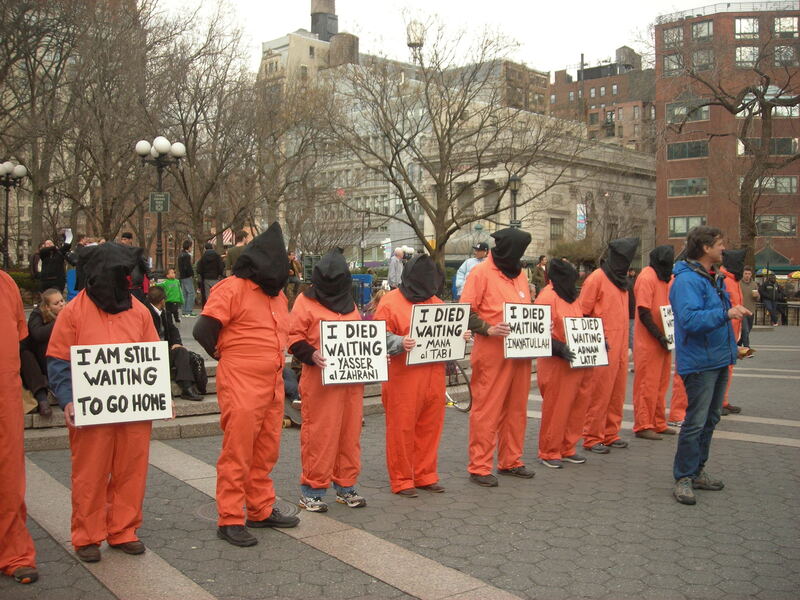 More than half of the 166 men at Guantanamo have been “Cleared for Release” by U.S. authorities yet linger in the prison wasting away. For the past six weeks more than 100 of the prisoners have been maintaining a hunger strike so as to bring attention to their plight. It has not succeeded hence the vigil in Union Square. It is a situation that should fill every American citizen who believes in the rule of law and some semblance of human dignity with shame and horror. How can you take seriously a group of teachers who are so ignorant (or pretend to be so ignorant) that they look stunned when you inform them that every dime of the $30 million Race to the Top extortion money will be spent, not on teachers and schools, but on consultants and corporations and other lucky players in the Corporate Education Industrial Complex. How can you not find reprehensible a group of teachers who rally, not for their fellow teachers who are being hounded and demoralized and degraded by an increasingly insane system, nor for their beloved students whose schools are being shut down and communities disrupted, but for the teacher’s union to immediately agree to an evaluation system riddled with mechanisms designed to destroy the careers of their fellow teachers? What really can you say about people who, in the face of the greatest assault on public education in American history, gather in a park on a Sunday afternoon to bellow idiocies such as “We want a deal! “ and ‘ I am not satisfactory! I am excellent!” And “ We crave feedback” , in a desperate attempt to please those committing said assault who are simultaneously their financial backers ? What can one conclude about the authenticity of any organization whose membership is infinitesimal and whose every policy is a crude re-writing of union busting corporate education reform policies yet it granted instant credibility and glowing press reports and editorials in the New York Post and Fox News right out of the egg? What can you possibly say about the integrity of a teacher who claims he left teaching and joined the leadership of the E4E, not because it infinitely easier and more lucrative than teaching, but because he just couldn’t bear to work under the present evaluation system any longer ? How can you not find despicable an organization of teachers who would if they could leave teachers with as many rights as an employee of McDonald’s while feeding their students a steady diet of test prep because this is what their hidden backers, billionaires and hedge fund managers, have required them to do ? Such is the farce, the disgusting and devious farce, called Educators 4 Excellence. Addendum: What follows is a post containing the ridiculous pretense for the ridiculous rally. Like the statements on the signs shown above, it speaks for itself. My name is Kate Schuster, and I am an elementary ESL teacher at PS 38. Last Tuesday I attended an E4E event with over 150 teachers and Chancellor Walcott, to discuss evaluation. As a result of the event, and the urgency of the issue, I will be rallying tomorrow and I want YOU to join me. Please stand with me on Sunday. The rally will be a ton of fun and it’s incredibly easy to get to. Plus you’ll get one of the sweet beanies I’m wearing in the picture above! You’ll find a map, including all nearby subways, and the details below. Lastly, there is the truth.